Just caught up with this: a fine essay over at the Deterritorial Investigations Unit – ‘Instead of building a genealogy of neoliberalism, we must build a cartography of the system’ – called “The sage speaks of what he sees”: War Games and the New Spirit of Capitalism. It’s a provocative Deleuzian take on the intersections between systems technology, military violence and the production of code/space, that starts with World War II and tracks on into the present (so in fact it combines genealogy and geography). Developments in aviation technology, such as the capability for flying at higher altitudes and more complex bomb and weapon systems, led to profound problems in fire-control: in high-speed warfare, it was necessary for gunners to be able to respond immediately to actions in the combat environment and to hit their targets with a greater degree of accuracy. In order to deal with this new machinic vision of warfare (which extends beyond the fire-control issue itself, as larger programs like the Manhattan Project indicate), militaries were quickly investing millions of dollars into scientific research in an effort to find mastery over combat theaters. Through science, the command structures of the military were seeking an orderly control over the environment. A central part in the narrative is played by the Semi-Automated [sometimes ‘Automatic’] Ground Environment (SAGE – hence in part the title) and its successor projects, including civilian derivatives like SABRE that revolutionised air travel ticketing (and Travelocity). On that tangled web, see Jordan Crandall on ‘tracking’ here (also here) and here. 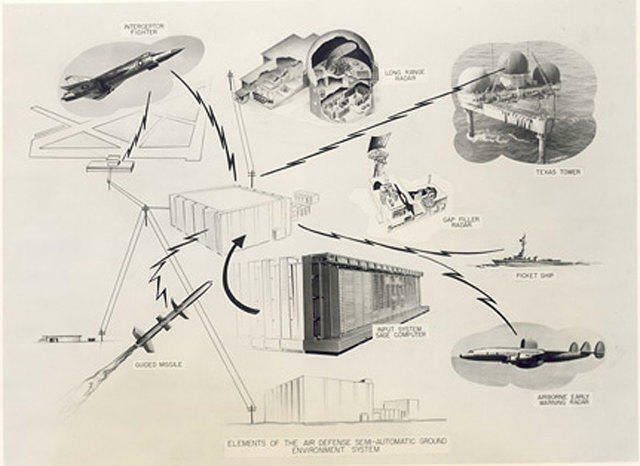 (1) a net of radars and other data sources and (2) digital computers that (a) receive the radar and other information to detect and tract aircraft, (b) process the track data to form a complete air situation, and (c) guide weapons to destroy enemy aircraft. 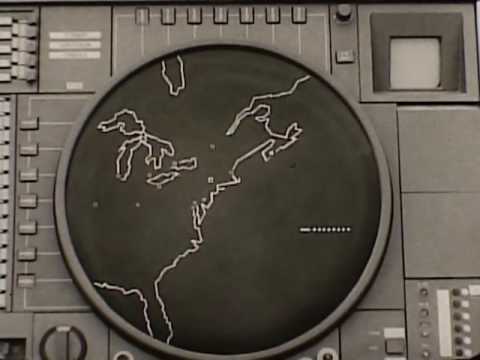 A large network of radars would automatically detect a hostile bomber formation as it approached the U.S. mainland from any direction. 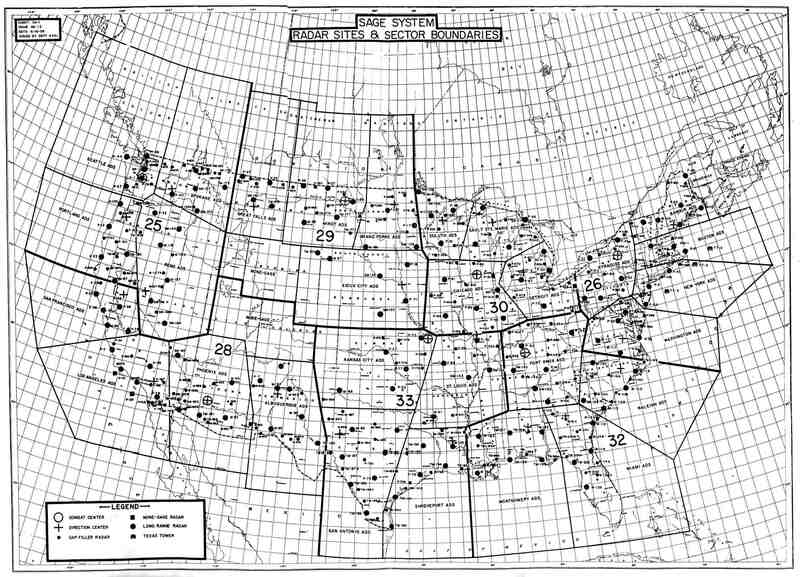 The radar detections would be transmitted over telephone lines to the nearest SAGE direction center, where they would be processed by an AN/FSQ-7 computer. The direction center would then send out notification and continuous targeting information to the air bases best situated to carry out interception of the approaching bombers, as well as to a set of surface-to-air missile batteries. The direction center would also send data to and receive data from adjoining centers, and send situational awareness information to the command centers. As the fighters from the air bases scrambled and became airborne, the direction center would continue to process track data from multiple radars and would transmit updated target positions in order to vector the intercepting aircraft to their targets. After the fighter aircraft intercepted the approaching bombers, they would send raid assessment information back to the direction center to determine whether additional aircraft or missile intercepts were necessary. This plainly reaches back to the air defence systems set up by Britain and Germany during the Second World War, but more significantly for my purposes it intersects with the sensor-shooter system that was at the deadly centre of the ‘electronic battlefield’ during the Vietnam war and with a stream of subsequent tactical (rather than purely strategic) developments. 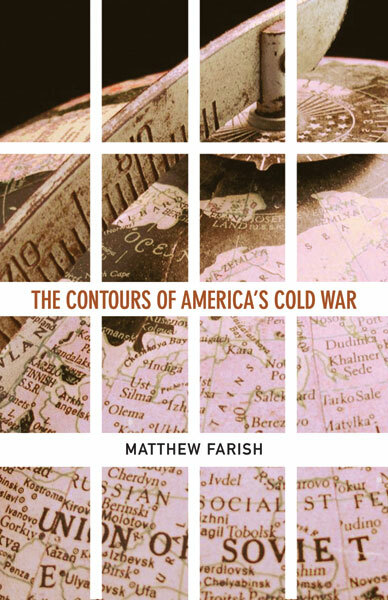 If you want to know more about SAGE and its spiralling military trajectory, I recommend Matt Farish‘s brilliant chapter in The contours of America’s Cold War (Minnesota, 2010), ‘The cybernetic continent: North America as defense laboratory’. More recently still, there’s Jeremy Packer and Joshua Reeves, ‘Romancing the drone: military desire and anthropophobia from SAGE to swarm’, Canadian Journal of Communication 38 (2013) 309-31. And, as their title suggests, all of this feeds into my continuing interest in the networks that make today’s drone wars possible, to which I’ll return shortly. This entry was posted in air wars, Cold War, technology and tagged air defence systems, Cold War, SAGE, Semi-Automated Ground Environment by Derek Gregory. Bookmark the permalink.